The Mill is about 500 yards away from the centre of the small village, Les Cabannes. This lies at the foot of the hill leading up to the medieval town of Cordes-Sur-Ciel (so named because it frequently disappears into the morning mists and appears to touch the sky). Wednesdays: Les Cabannes is a lively village with a weekly market and an open air cinema which alternates during the Summer, with live street music, performed outside the local bar/restaurant. A short, sharp walk up a steep incline in the middle of the village, will take you directly to the walled town of Cordes. There you can rest for a while in the Jardins de Paradis or enjoy a drink on the Panorama terrace at the top of the town. Cordes is made up of a myriad of charming streets, grand portes and fascinating nooks and crannies. There are several art and craft galleries, a museum of sugar and a miniature instrument museum. In mid-July the whole population hires costumes and takes part in a reanactment of the visitation of the Dauphin in xxxx. 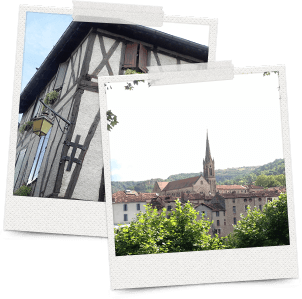 At the foot of Cordes, lies the lower part of town which has ample facilities such as banks, several supermarkets, a post office, newsagents/tabac, the pharmacy, a salon du thé, as well as several bars and restaurants. On Saturday morning, there is a wonderful market selling local produce. The local campsite is situated just 1km from the Mill. There is ample space for camping or parking a campervan; but chalets are also available to rent. The site has an open air swimming pool which is open to the public. By popular request we usually arrange a wine-tasting evening at a local vineyard, followed by supper out. This is not obligatory (nor is purchasing wine!) but most of our guests enjoy the trip. We would be very pleased to help you book other activities during your stay. These include horse-riding in the Gresseigne forest, French tuition with one of our local tutors, yoga (this can be arranged in the Mill if there are sufficient numbers, cycling, walking and kayaking trips.